With the credits rolling, the final episode of The Final Season ends. And I’m not sad. I remember crying at the end of the first season, after forcing Clementine to leave Lee behind, leaving him to the change because he (I) just couldn’t make her carry out that final death. 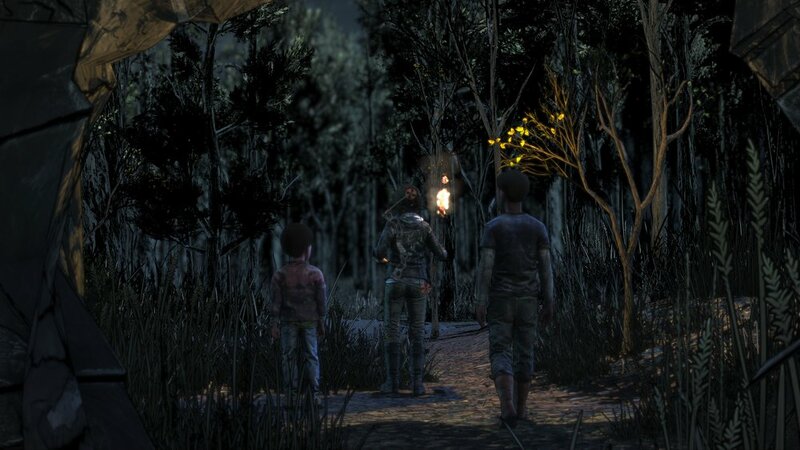 The episode’s title, Take Us Back, is more than just a call from Clementine’s small group as they try to escape an exploding boat, but a mandate from the developers to let them take us back, one more time, to see it done. And I’m not sad that it is. Some small spoilers follow as I discuss a couple of key points from the episode. The episode is really kind of a microcosm of The Walking Dead as a whole. It starts with a bad thing happening, the bad thing gets worse, our heroes find themselves in a small quiet spot that’s safe enough to take a moment, that safe spot collapses, very bad things happen, and choices have to be made. What I think stands out most about this episode is the addressing of the choices itself in a conversation between Clementine and AJ. For a five/six year old, AJ has an understanding of the world he lives in that many of the adults, those who remember a time before everything went zombie rotten, simply can’t. He’s seen people he cared about die, he himself carries the weight of the lives he’s taken, and up until this point, Clem has only been able to tell him that killing should never be your first option… unless it has to be. And it’s those points where reality weighs in on the situation, when the call is not as easy as simply choosing between black and white, that begin to take their toll on AJ. As they should. So stuck in a cave, with the dead closing in, AJ has it out with Clem. He’s going to have to make tough decisions, he says, and he needs to know that he can do that and that she will trust him too. As a parent, this is one of those moments you wait for, for your child to tell you that they’re no longer a child, that they are ready, and will not be dissuaded. It’s weird to hear these thoughts coming from someone as young as AJ, but at the same time, we’ve watched him grow up in this terrible world, watched him do things that he should not have to do, and as he tells Clem that he doesn’t think murder in this hellscape means what she thinks it does anymore, I believe him. At the end of the day, in the world they’ve been given, AJ is probably the most capable of making choices that lead to survival. Depending on how you respond to AJ, and I responded in the positive, the next few choices he makes he does on his own. Some of these are scary, scary choices, but it’s amazing because they ultimately lead up to the biggest question of this and all the games - Does Clementine survive? I am not going to answer that question for you. I will say that I was surprised, and I will admit that parts of this episode had me holding back tears. Bad things happen. No question. But there are good things, too, and if they wanted to, which they shouldn’t, there’s a future for Ericson Academy and the kids who call it home. The walls work, the river is still full of fish, and when they’re confronted by the monsters, be they living or dead, they always aim for the head. As for the rest of the episode, I appreciate the closure we’re given regarding some of the relationships. Though the explosion rocks Violet, we see her come back around to the group, even after her sister was revealed to have been still alive on the exploding boat. Because of choices I made, there are some really nice moments between Clem and Louis as well as AJ and Louis. 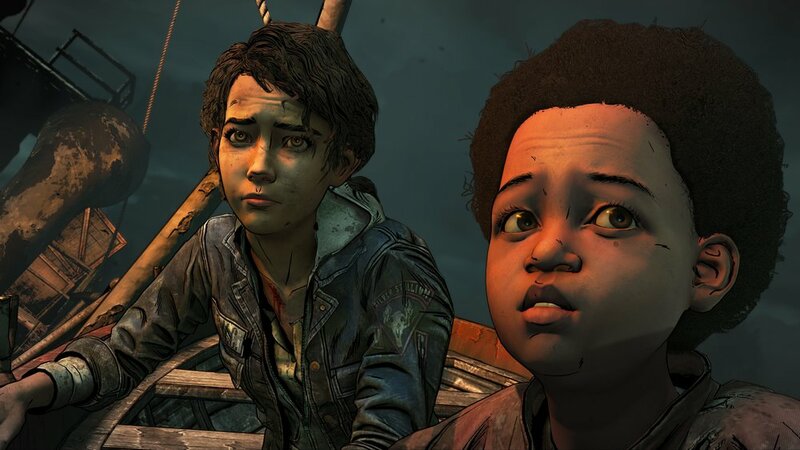 But at the end of the day, the real relationship that matters is Clem and AJ, and I think this episode cements that as one of the strongest, most real relationships depicted in a game. It’s also telling that they are not related, not blood, and yet they are family. This point, that family is not just who is related to you, has been one that goes back all the way to the first season. The only downside to the episode is its over-reliance on the things that The Walking Dead, and Telltale style of game in general, has always failed at: action. So much of the middle section of the episode relies on the slow-paced environment walk combined with the bad shooting mechanics that I had to restart sections numerous times just to get through. I don’t understand this choice, when other more action oriented franchises, like Batman, just felt like they handled it better. Where the disconnect happened, and why it was felt that this story needed Clem to engage in the crazy amount of aiming she did, I will never know.